1. the taking or moving of something from one place to another. 2. the moving of a patient from one surface to another. Patients can be taught to transfer safely either independently or with minimal assistance if they can balance in a sitting position. gamete intrafallopian transfer (GIFT) a type of assisted reproductive technology consisting of retrieval of oocytes from the ovary, followed by placement of oocytes and sperm in the fallopian tubes by laparoscopy. Gamete intrafallopian transfer (GIFT). 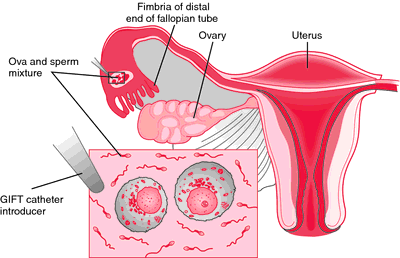 Multiple ova and washed sperm are injected into the fallopian tube, where fertilization may occur. From McKinney et al., 2000.
passive transfer the conferring of immunity to a nonimmune host by injection of antibody or lymphocytes from an immune or sensitized donor. sliding board transfer a method of transferring a patient: a smooth tapered board is placed under the patient and stabilized on the surface to which movement will take place so that the patient can glide across. tendon transfer surgical relocation of the insertion of a tendon of a normal muscle to another site to take over the function of another muscle inactivated by trauma or disease. 1. a method of assisted reproductive technology consisting of retrieval of oocytes from the ovary, followed by their fertilization and culture in the laboratory with placement of the resulting embryos in the fallopian tubes by laparoscopy more than 24 hours after the original retrieval. 2. laparoscopic transfer of cryopreserved embryos to the fallopian tubes. zygote intrafallopian transfer (ZIFT) a type of assisted reproductive technology consisting of retrieval of oocytes from the ovary, followed by their fertilization and culture in the laboratory and the placement of the resulting zygotes in the fallopian tubes by laparoscopy 24 hours after the original retrieval. 1. Process of removal or transferral. 2. A condition in which learning in one situation influences learning in another situation; a carry-over of learning that may be positive in effect, as when learning one behavior facilitates the learning of something else, or may be negative, as when one habit interferes with the acquisition of a later one. /trans·fer/ (trans´fer) the taking or moving of something from one place to another. gamete intrafallopian transfer (GIFT) retrieval of oocytes from the ovary, followed by laparoscopic placement of the oocytes and sperm in the fallopian tubes; used in the treatment of infertility. 1. retrieval of oocytes from the ovary, fertilization and culture in vitro, then laparoscopic placement of resulting embryos in the fallopian tubes more than 24 hours after oocyte retrieval; used in the treatment of infertility. zygote intrafallopian transfer (ZIFT) retrieval of oocytes from the ovary, fertilization and culture in vitro, then laparoscopic placement of the resulting zygotes in the fallopian tubes 24 hours after oocyte retrieval; used in the treatment of infertility. to move a person or object from one site to another. a nursing intervention from the Nursing Interventions Classification (NIC) defined as moving a patient with limitation of independent movement. See also Nursing Interventions Classification. (1) A popular term for a patient whose care has been passed from one service to another. (2) The changing of a thing’s position in relationship to others. verb To pass the care of a patient from one service or ward to another. When the care of an individual is passed from one professional to another and/or one agency to another and/or one location to another. noun A neurologic equivalent applied to a time, place, or situation other than the way in which the equivalent was initially learned. noun The moving of a fertilised egg or more advanced reproductive product from one environment to another which is more suitable for long-term survival. 1. A popular term for a Pt whose care has been passed from one service to another. 2. The changing of a thing's position with relationship to others. See Blastocyst transfer, Egg transfer, Electron transfer, Electronic funds transfer, Embryo transfer, Gamete intrafallopian transfer, Gene transfer, Linear transfer, Microvascular free toe transfer, Somatic-cell nuclear transfer, Zygote intrafallopian transfer verbTo pass the care of a Pt from one service or ward to another. 1. Process of removal or change of place. 2. A condition in which learning in one situation influences learning in another situation; a carryover of learning that may be positive in effect, as when learning one behavior facilitates the learning of something else, or may be negative, as when one habit interferes with the acquisition of a later one. 3. In physical therapy, movement of a patient from one surface (e.g., bed, chair) to another. By studying and applying general semantics, one can cultivate many of the transferable job skills noted by Kanchier and Whitaker. Bridging the Gap: A Learner's Guide to Transferable Skills. Transferable skills: Creating, artistic, self-expression, dramatizing, musical, entertaining, writing--a biracial boy liked to sing, dance, play the piano, write, act, and draw. Transferable skills: Planning, goal setting, budgeting money, committee work, sales--a biracial girl planned a trip with her mother that entailed selling candy and budgeting money. The Fund's stockholders of record as of 18 August 2010 are being issued transferable rights allowing them to subscribe for a total of about 5. Our Transferable Flag Label enables pharmacists to solve that problem, while the new AutoLabel BC500 reduces the labor needed at the pharmacy and on the patient floor. is a leading software and solutions provider offering the first end-to-end integrated solution for creating and managing complex electronic contracts, transferable negotiable instruments, securities and source records. NYSE: GCH) has approved the Fund's intention to conduct a transferable rights offering of additional common stock of the Fund. The offering will grant holders of the company's common stock transferable subscription rights to purchase shares of the Company's common stock at a subscription price of $7. Each unit comprises one common share and one-half of one transferable Series H share purchase warrant.